Travel to another dimension with space themed onlineslots Joker Gems. Joker Gems is bursting with spectacular colour and golden star prizes. On your travels to a planet far, far away, your dreams may just come true. Just like a shooting star, an array of beautiful shiny gems will shoot across your screen to create stunning patterns of mystical light. When the gems form into clusters, you'll have the chance to respin and if the universe is on your side, you may even win the gold jackpot. Remember, the bigger the cluster, the bigger the reward. You could win up to 700 times your total stake! 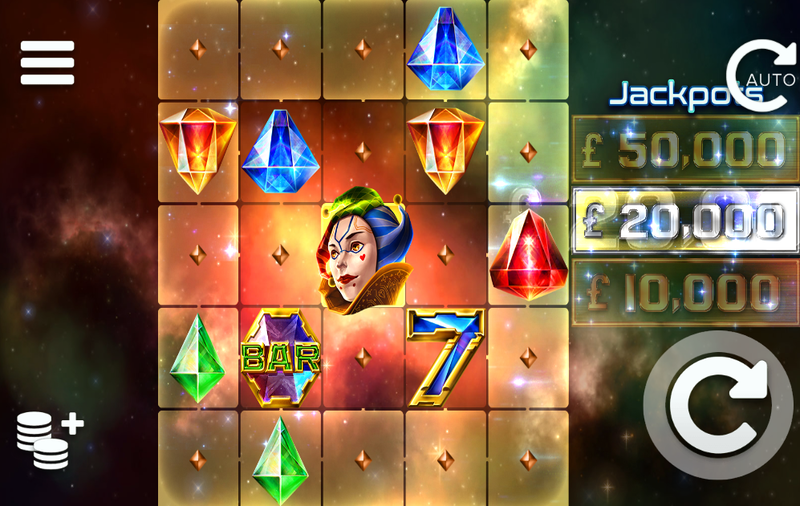 Joker Gems is one of the best video slots space themed developed by Elk Studios. It's displayed on a 5 by 5 grid and uses a cluster pays system. It's set in a galaxy millions of kilometres away from where unimaginable and magical things can happen. The reels are placed behind a deep midnight sky with lots of twinkling stars, planets and space dust. The symbols include an array of shiny bright gems of different shapes, colours and sizes including a gorgeous ruby gem, sapphire, amber and emerald. You'll also see the joker, a sparkling lucky 7 and a diamond bar. Chasing Clusters - Bigger gem clusters equal bigger and more exciting wins. 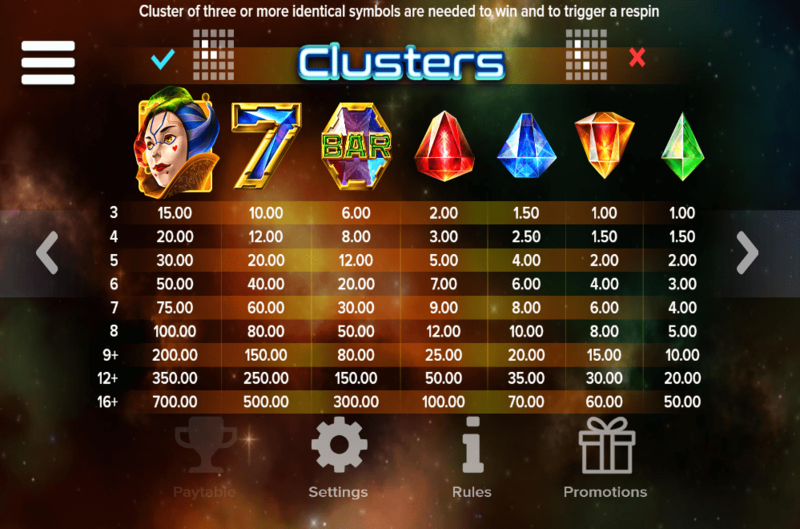 Simply connect 3 identical symbols to activate a respin and get a cluster win. Having the chance to respin gives you the opportunity to grow clusters for bigger prizes. The respins will continue until no identical clusters can be found. Three Jackpots - Joker Gems has 3 fixed cluster patterns that all award different jackpot values. The jackpot values on offer are 10, 000, 20,000 and 50, 000 EUR. If you play with a higher stake, this will increase your chances of winning one of the exciting jackpots. The jackpot can be won numerous times, so cross your fingers for a big, sparkly win. Light Chaser Feature - The light chaser feature is activated randomly throughout the game. The light chaser will zoom across the grid and randomly come to a halt. You will then be awarded with 4 or 5 identical symbols, as well as a free respin. There are lots of gem-themed slots out there, so if that's the kind of slot you enjoy then you'll love Joker Gems. The design is great, especially with the colourful nebula in the background and the glistening gem symbols. There aren't too many features in this slot but there are some great prizes to be won. There are 3 huge jackpots up for grabs, as well as the chance to win 700x your stake. enjoy this slot game? give Peking luck a go!